A Jamaican woman became the queen in a Yoruba kingdom, and her people are so excited, they made a story out of it. 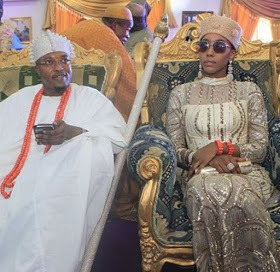 The Imperial ruler of Iwo kingdom, Oluwo of Iwo, Oba Rasheed Adewale Akanbi, met and married his wife, a Jamaican known as Chanel Chin, in Canada early this year. 32-year-old Chanel Chin, who is the daughter of a Jamaican reggae artiste, Ludlow Chin aka Bobo Zaro, became the queen of Iwo Kingdom in Osun state. The new queen reportedly told a Jamaican news outlet, The Gleaner, that she was very honoured to be representing Jamaica in that big way. Here’s what she had to say: “My ancestors were taken away as slaves, but I have returned to Africa as a queen. One’s destiny cannot be altered. As a young child, I always wanted to come to Africa, but didn’t know how. I feel this is a great opportunity for black people worldwide to return to their home. Our forefathers and ancestral mothers were cast away as slaves to never return, but I want Jamaicans everywhere to know that Africa is so nice. The culture and traditions are so rich and lovely. It’s truly something every black person should come and experience.” The queen went ahead to say her responsibility towards the women and young girls in her community entailed her setting a proper example for them, including dressing in conservative and respectful outfits according to the tradition.